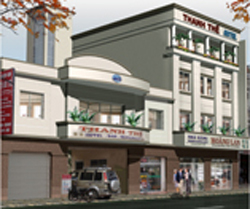 Located in the center of Da Lat, included perfect services, reasonable price, Thanh The hotel is a ideal place for tourists who come to. Being two-star hotel with trade-mark “Da Lat Green Hotel”, Thanh The has high-grade and luxurious bedrooms, quiet space, safe parking in the yard. Besides, there are abudent and quick services which satisfy to tousist’s requirement. With guideline “Quality makes difference”, it is sure that tourists will have comfortable and impressible time in DL flower city. - Safe parking in the yard. - Next to Walking Town. - A 350-seat restaurant Hoang Lan. - Sattelite TV with 42 international and local channels. - Interior decoration: using natural materials, wooden furniture. - Plaster ceiling, whitish wall, green glass windows which reduce noisy. - Sauna-Massage, Sourvenir, conference, birthday, wedding…. - Service: bedroom, Asian & European Food, massage, Sauna, coference, meeting, bar, tour ticket, internet service and other services on demand.